None the less, it is good practice and good business sense for every professional thermographer to have a calibration system in place. 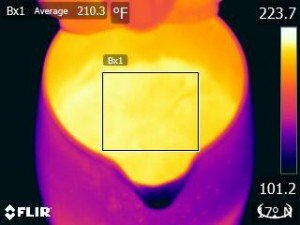 At a minimum, annual “documented” calibration lends credibility to your thermal imaging business as well as gives the thermographer something to fall back on should some crafty lawyer question your inspection standards and the validity of your camera equipment. The following are 3 accepted procedures for checking the calibration “functionality” of your infrared camera. Together, all techniques cover a range of temperatures and, if done on a regular and documented schedule, can provide a reliable and credible criteria. 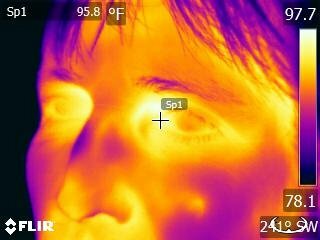 Adjust camera emissivity to 0.97 – water and human skin. The emissivity values vary slightly (+ or – 0.01) depending on where you search for information. The key is to be constant with the emissivity values that you choose. Ice Bath and Teapot: Choose an “area box” tool and size box so that perimeter of box is just smaller than what you are measuring. Tear Duct: Choose spot measure tool and focus on tear duct. Set “time and date stamp” to appear on IR camera screen. For this event, I affixed my IR camera to a tripod (not necessary) but it does allow for hands-free manipulation of equipment. Ice Bath Method – Fill coffee mug (or equivalent holder) with ice and cold water. Stir ice water thoroughly for a few minutes – add more ice if necessary. Focus camera on target adjusting area box within ice bath. Stir ice water again. Temperature should read approximately 32°F. Take thermal and digital image and SAVE. – Bring water in pot to a rolling boil (tilt pot to avoid steaming camera lens during procedure). 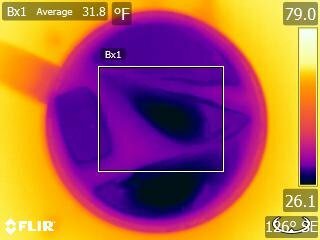 Focus camera on target adjusting area box within boiling water bath. Temperature should read approximately 212°F. Take thermal and digital image and SAVE. Some recommend doing this “hot temp” procedure using a coffee mug filled with boiling water. After having performed the procedure many times with different mugs and with constant stirring, I have found the results to be inconsistent and therefore not reliable. Tear Duct Method – Focus camera on tear duct of test person. Temperature should read approximately 95°F. Take thermal and digital image and SAVE. For optimal results, this test should be done on the same person to produce a repeat baseline. IMPORTANT: Transfer saved images to folder on computer and also back up information on thumb drive or external device. Done!!! It is a smart habit to do these calibration procedures frequently so that if the camera slips out of calibration you are able to correct for this without making inaccuracies in your measurements. These quick checks don’t replace any requirements for camera certification by a certified facility, but are most certainly acceptable thermal practices in our industry. At the end of the day, your calibration interval should be something that is addressed in the written policy of your infrared inspection program.